Chicago, IL – October 7, 2015 – PetCure Oncology, the leader in cancer care for pets, is proud to announce that its newly-created Scientific Advisory Board (SAB) recently met for the first time and reported immediate progress in their effort to establish safe, reliable, and effective standards for the delivery of veterinary stereotactic radiosurgery (SRS). 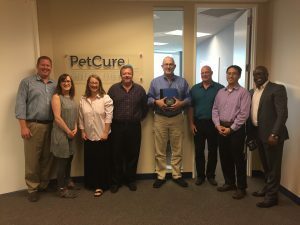 PetCure Oncology’s formation of the SAB underscores its commitment to providing pet families with the highest standards of care and service, especially pertaining to the delivery of SRS, an advanced form of radiation therapy that is being made available to pets on a broad scale for the first time. As leaders in veterinary cancer care and SRS, PetCure Oncology has put together a team of experts to refine protocols and establish standards that can be used across the industry to optimize the efficiency and effectiveness of SRS. The first meeting of the Scientific Advisory Board was held in late September at PetCure Oncology’s corporate headquarters in Chicago. The SAB embraced PetCure Oncology’s mission to revolutionize cancer care for pets and committed to rely on medical science as the primary driver for the development of SRS clinical guidelines and standards. They also set forth recommendations for standardized data collection of key clinical indicators. The SAB then quickly jumped into their ambitious project, utilizing their extensive clinical experience and diverse areas of specialty to establish pre-treatment processes, treatment delivery processes, and dosing standards for SRS treatments. Cancer accounts for nearly 50 percent of all disease-related pet deaths and is the leading cause of death in older dogs and cats. PetCure Oncology is revolutionizing cancer care for pets by establishing veterinary SRS centers across the country. Centers in Phoenix, Cincinnati, and Clifton, NJ are operational. Locations in Wisconsin and Illinois are slated to open in the next few months, with many more in various stages of development across the country.